I volunteered, interned and then worked full time for the Partnership for Interdisciplinary Studies of Coastal Oceans (PISCO) subtidal group. They monitor California Marine Protected Areas (MPAs) by performing SCUBA surveys on fish, algae and invertebrates at MPA and reference sites. They also construct and maintain oceanographic moorings and maintain equipment (Thermisters, Acoustic Doppler Current Profilers) as well as conduct a rockfish recruitment monitoring program. It was advantageous to operate boats, conduct dive teams to complete surveys and become a better diver while learning the coastal marine flora and fauna of California. 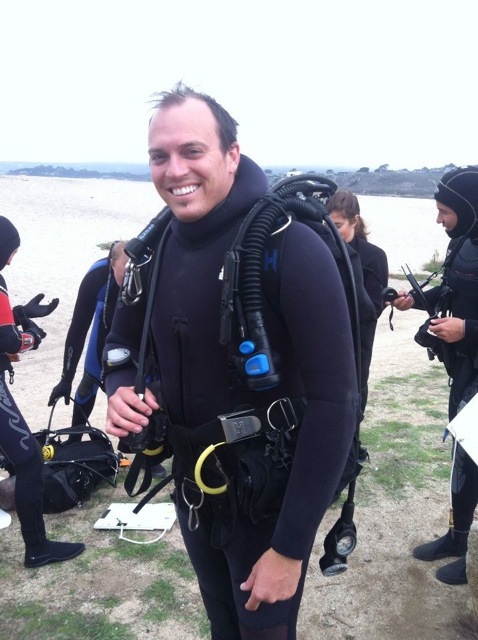 I also helped graduate students with their work at Long Marine Lab, UCSC and became a NAUI SCUBA instructor. I think that after you get up at 6am for four years to collect data for others you want to start your own study eventually. But seriously I began to notice patterns both seasonally and among species and through this got interested in performing my own study on some aspect of the marine world. During my kelp forest ecology class at UC Santa Cruz I realized I wanted to pursue graduate school. Our group investigated the partitioning of spider crabs at Hopkins Marine Station in Pacific Grove. It was interesting to find out these species of spider crabs live in different micro-habitats right next to one another. I loved the process of asking a question, developing a hypothesis, designing an experiment, collecting data, analyzing data, and then interpreting the results. I knew I wanted to repeat this process on other systems the rest of my life. Deciding to learn to SCUBA dive was a big step. I was always a little afraid of the ocean and its inhabitants, so to become comfortable in the water was challenging but ended up not being as difficult as I thought. Working for PISCO was like a SCUBA boot camp and really helped shape who I am today. The people were also very motivational, working with people so passionate about the ocean and seeing them continue onto graduate school showed me there was life after my first job. I am studying the ecology of rhodolith beds at Catalina Island, CA. Rhodoliths are unattached coralline algae that aggregate and interconnect to form beds. At Catalina most rhodoliths are around 2 cm and blanket the bottom like pink tumbleweeds. Mantis Shrimp in a Catalina Island rhodolith bed. Although these beds are globally distributed the only place they are located from Alaska to Baja is at the Channel Islands. The rhodolith beds occur in protected bays and harbors, which is the best place for mooring boats, unfortunate as the mooring chains crush rhodoliths. The rhodoliths are very slow growing and fragile, a bad trait for the level of disturbance. Conservation is important to me, Wallace J. Nichols inspired me when he said something to the effect, “How can we protect what we do not understand”. Due to the rarity in California and fragile nature of rhodoliths I wanted to study the ecology and community of the beds to learn more about their ecological role and if shown to be important later protect them. I have generated species lists of the sand and rhodolith habitat at three coves and plan to investigate benefits, such as food and shelter, associated invertebrates have to this living habitat. Checking the job market when I’ve graduated, now having a masters!, is the first thing, but continuing my education is next on the list. I plan on pursuing a doctorate and then moving on to a job at the Monterey Bay National Marine Sanctuary (MBNMS), National Oceanic and Atmospheric Administration (NOAA) or teaching at the state or university level. The knowledge I’ve gained is realized when I think back a year ago and how much I have changed since then, it’s amazing. The opportunities to travel to places like Baja and Chile were rewarding, but they come at a price. The price is balancing a job, classes, homework, lab meetings, research, family, and a personal life while attending graduate school. You come out a much more knowledgeable and well rounded person. If you have a strong foundation in physics, chemistry, biology, genetics, statistics and especially writing you will go far in marine science, if not start studying. I struggled catching up from not studying enough in high school, I slacked off, if I could go back I would study a lot harder and be much better for it. I would add starting to volunteer and find your interests early, it helped me network and get opportunities by putting time toward an organization and showing I was dedicated.